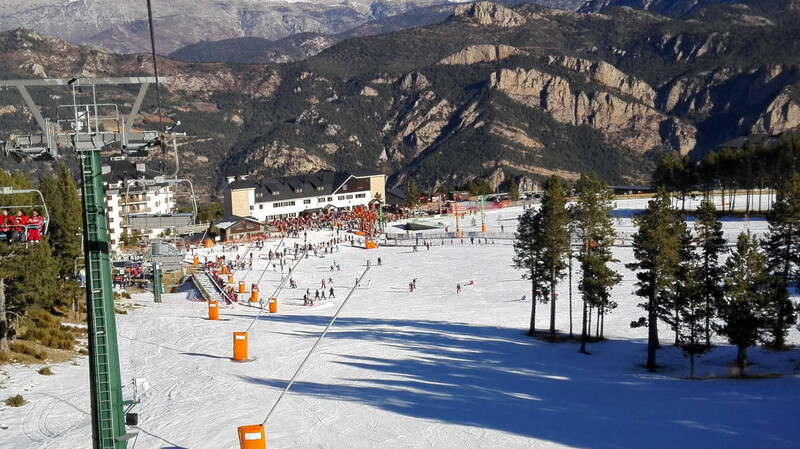 Fast access from the main urban centers of Catalonia (1.5 hours from Barcelona), the ski resort of Port del Comte is located in the region of Solsonès (Lleida) in the Catalan Pyrenees. It is a popular destination for families and is particularly appreciated by all skiers looking for outdoor activities, nature and sports. Divided into two distinct sectors (Hostal-Sucre-Bòfia and Estivella Area), the ski area in general benefits from good snowfall resulting from negative temperatures combined with rainfall emanating from the Mediterranean influence. This natural snow also has the backing of a powerful network of snow culture that guarantees the quality of the snow and the return of the ski stations to the feet throughout the season. The area totals 50 kilometers of tracks divided into 7 green, 11 blue, 13 red and 6 black. It extends between the snow front (at 1700 meters altitude) and the summit of the Estivella sector (beyond 2300 m). Since the 2000s, a vast investment and renovation plan has literally transformed the Port del Comte resort. We emphasize, the replacement of the old ski lifts by more comfortable and fast chairlifts, the establishment of carpets for beginners, the installation of high pressure poles for the production of the snow culture, the improvement and the accesses of asphalting and parking, tracks of remodeling and grass, etc. These investments, year after year, contribute to the renovation and modernization of the complex and customer satisfaction. In addition to skiing, Port del Comte offers a wide range of activities, both for children and adults: you can take long snowshoe walks on the many itineraries while enjoying the breathtaking scenery. The adventure park is also a must-see with its acrobatic circuit through which you will have to overcome the various obstacles between the trees. Another alternative: the snowtubing that allows you to follow the descents perched on a large buoy that slides along a giant slide of snow.